Discussion in 'College Football' started by ScriptOhio, Sep 21, 2015. Some of the best plays from Leonard Fournette's 228 yards, 3 TD performance against Auburn on Saturday. Would enjoy playing LSU. 302 yards passing vs 945 yards rushing. Our CBs would force them to be even more one dimensional and our D-line would get gashed in the first half and make adjustments in the second. Though I would say Bama and Arkansas are both built to beat them and I see them losing both of those games. so far we have been able to run the ball was whenever the hell we want to. and really haven't had the throw it yet. there will come a time when that ain't gonna work. how we handle that situation will determine if we're any damn good or not. but so far through 3 games I think our biggest weak spot is special teams coverage units. they scare the hell outta me every time we kick/punt. Based on yesterday I would not. Now I know that OSU also refused to bring down safeties to load the box, but the DTs and MLB were getting worked at times. Plenty of time to further develop the run defense, but it'll take a lot before I'm excited to take on the LSU offense. Big power backs have been our achilles heel the past 2 years. I want no part of Fournette in the absence of Kiffin going away from a sure thing. I hate complaining about a 3-0 start with 2 division wins already. but I'd like to see more of what Brandon Harris can do before I get too excited. He's the most physically gifted qb we've had since perilloux. in his short amount of playing time we've seen flashes of greatness, a meltdown, and some mediocrity. I'm really curious to see which of those 3 will become more of the norm for him. Surprised we haven't seen much of the air game. I guess you missed your opening scrimmage to give it a try. But these early games are where you attempt figure it out. Especially once you have a big lead. I know the card says run the ball but you don't want to play Bama or florida or ole miss who all have elite run defense and not have practiced throwing the ball much against teams like cuse or auburn. I mean doesn't harris have like a 70 percent completion so far? Give him a go and lsu becomes a quick natty favorite in my mind. Keep fournette running for 70 percent of the teams yardage and I just see 2 losses in there. That is what sec defenses are built to stop. not have practiced throwing the ball much against teams like cuse or auburn. Heheheheheh. I think you just implied auburn is a cupcake. I like you. I think that was the original plan. but without the McNeese game we had to go with our bread and butter to beat State. then Auburn got out of hand so quick we really never had the chance to throw it. I expected the Syracuse game to go about like it did. 11am kickoff against a team that couldn't stop Fournette if they had 14 guys on the field. that's what they are this year. which is surprising, because even in their worst years they at least put up a fight. that team quit trying about halfway though our game. Saw31, LovelandBuckeye and Palpie like this. 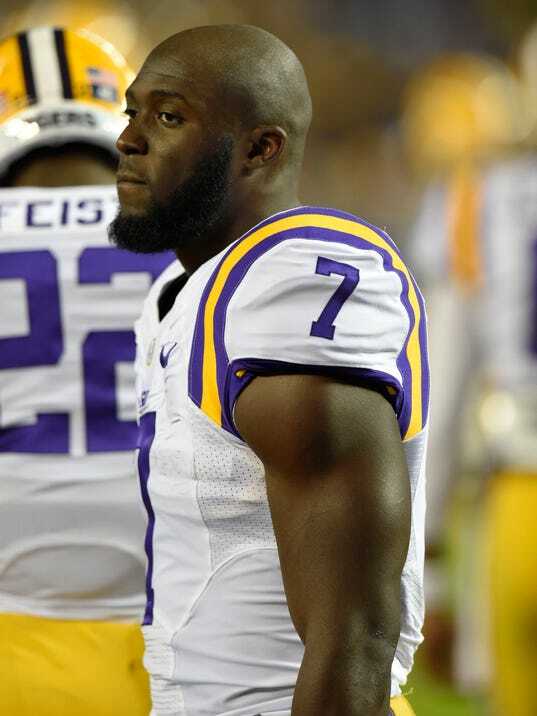 LSU is investigating whether the family of star running back Leonard Fournette violated NCAA rules, according to a person familiar with the matter who spoke on the condition of anonymity because of the sensitivity of the situation. Bob Barton, an attorney representing LSU, has begun interviewing people involved in a website that was built to sell merchandise emblazoned with “BUGA Nation” — Leonard Fournette’s catchphrase — the person told USA TODAY Sports on Tuesday. Barton, who works for the law firm of Taylor Porter in Baton Rouge and specializes in matters involving NCAA rules, declined to comment. Paul Price, described by Fournette's mother as the family’s manager, made payments of about $10,000 to build a website and produce the merchandise to be sold, the owners of three companies involved told USA TODAY Sports. The owners said they gave Price and the Fournettes more than $20,000 in discounts because they expected strong sales driven by the star running back's popularity. brodybuck21, maximumblitz and kujirakira like this.